Tejas Networks IPO opens next week following up on poor listings of PSP Projects and Indigrid InvIT Fund. Nevertheless, the IPO will look to capitalize on the positive mood in the stock markets. The IPO will be managed by Axis Capital, Citigroup Global Markets India, Nomura Financial Advisory and Securities, and Edelweiss Financial Services while Link Intime has been appointed the registrar. Priced in the range of INR250 – 257 per share, Tejas Networks IPO will raise a total of INR776.7 crore (INR7.76 billion) at the upper end of the price band through a mix of fresh shares and an Offer For Sale (OFS) by existing shareholders. Investors can place their bids till 16 June in multiples of 55 shares. In Tejas Networks IPO review, we try to find out the positives and negatives and if retail investors should subscribe to the offer. Here are some important details of the IPO. As mentioned above, Tejas Networks IPO will mobilize nearly INR777 crore. This will be split into INR450 crore by issuing fresh shares and INR327 crore from existing shareholders which plan to sell 12,711,605 shares through an OFS. Out of the INR450 crore by issuing new shares, the company intends to spend INR303 towards working capital requirements while nearly INR45.3 crore will go towards payment of salaries and wages of research and development team. Among the existing shareholders participating in the OFS are Cascade Capital Management Mauritius (5,330,000 shares), India Industrial Growth Fund Limited (2,514,147 shares), and Intel Capital (Cayman) Corporation (1,066,361 shares). It is important to highlight that the company has no identifiable promoter. Sandstone Private Investments (897,450 shares), CEO Sanjay Nayak (790,000 shares) and Kumar N Sivarajan (593,000 shares) are other important investors participating in the OFS. Tejas Networks is a manufacturer of optical and data networking products and has customers in over 60 countries. These products are used to build high-speed communication networks that carry voice, data and video traffic from fixed line, mobile and broadband networks over optical fibre. Major of its clients are telecommunications service providers, internet service providers, utility companies, defence companies and government entities. Tejas Networks has strong credentials, technically speaking. The company’s Chief Technology Officer (CTO) Dr. Kumar N. Sivarajan was the first chairman of TSDSI (Telecommunications Standards Development Society India) and continues to serve on the society’s governing council. Another director Gururaj Deshpande is a well-known personality in technology space. Although his claim to fame, Sycamore Networks no longer operates, he is well-regarded as a thought leader. India is the biggest market for Tejas Networks as its accounts for 65% of the company’s revenues. For the year ended 31 March 2016, Tejas Networks was the second largest optical networking products company in terms of market share in India, with a market share of 15% in the overall optical networking market. The company has an established local presence in India with four sales offices and 15 support centres. 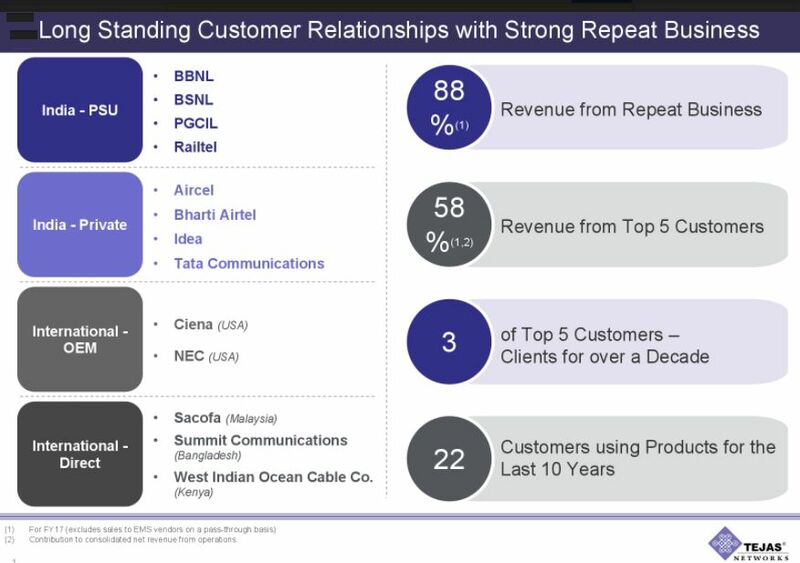 Tejas Networks counts leading telecommunications operators and public sector utilities as customers and this includes Bharti Airtel, Tata Communications, Aircel, Bharat Sanchar Nigam Limited (BSNL), Power Grid Corporation of India, RailTel Corporation of India. The company outsources most of its manufacturing to third parties and operates on an asset light model. Tejas Networks has demonstrated impressive financial performance in recent years and except a decline in FY2015, it has registered growth in annual revenues. The nature of the industry is such that there are not many competitors, even though competition is quite high. This naturally helps in customer retention and Tejas Networks has done well on this front. Three of its top five revenue generating customers have been continuing to use its products and services for over a decade. Thanks to growing revenues, Tejas Networks’ earnings have also surged tremendously in these years. In FY2013, it booked a loss of INR79 crore but earnings improved to INR63.2 crore in FY2017. Despite the improvement in earnings, its margins are at 7.2%. This indicates there is scope for further improvement from these levels. Tejas Networks IPO Review: Should you invest? Globally, data usage has been growing steadily year after year and the trend appears unlikely to reverse anytime soon. According to some forecasts, rising smartphone penetration and a massive increase in data traffic will lead global optical capital expenditure to grow from USD14.6 billion in 2014 to USD17.9 billion in 2020. The situation is not very different in India where expenditure on optical equipment is expected to grow from USD391 million in 2014 to USD869 million by 2020. This translates to average growth rate of 14.2%. In its red herring prospectus, the company states that less than 20% of cell towers in India are connected on fibre, as compared to 70-80% in developed countries. There is simply no doubt that network operators in India have been behind the curve in terms of investing in optical fibre transmission when compared to their peers in China and the United States. However, the situation is going to change now as rising smartphone usage fuels data demand. This should be a tremendous business opportunity for companies like Tejas. Apart from fundamental checking, investment in the IPO is also a function of valuations. Going by its FY2017 earnings, Tejas Network’s earnings per share (EPS) stood at INR9.4 which values the IPO at a price by earnings (P/E) ratio of 27.3 at the upper end of the price band. It is also noteworthy that Tejas has no listed peer to compare these figures. Nevertheless, considering the positive outlook of the industry, Tejas Networks’ leadership and its improving financial performance, this valuation doesn’t appear too high. However, as Sycamore’s fate tells us, one shouldn’t be complacent in technology space for too long. As a result, it is the kind of stock in your portfolio you might want to keep an eye always. Overall, Tejas Networks IPO review reveals the company may be a good play on India’s growing data demand. This is a high risk investment for RII. Better to avoid.